How do you ensure great customer service? Adaptable demand management? Quickest delivery times? Best customer experience? 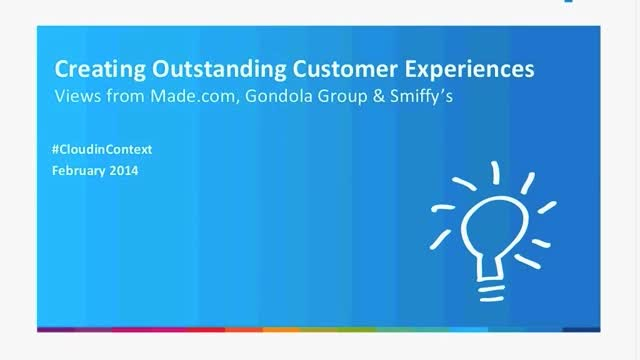 Watch the webcast now to find out how MADE.COM, Gondola Group (owners of Pizza Express, Zizzi, Ask), and fancy dress manufacturer and retailer, Smiffy’s tackle these questions with the support of the Cloud. Cloud has moved beyond the realms of market hype to become a reality, but for many the journey has only just begun... What risks do you face when moving your IT workloads to a cloud environment? What regulations do you need to take into account? How do you establish what you need in a market proliferated by different providers and platforms? This webinar will answer some of the practical questions companies face when exploring the next step on their Journey to Cloud. This is a webinar for those looking for tangible, strategic guidance and best practices in starting or progress up the 'cloud ladder'. Join us for a mini deep-dive into Automation & Microservices in the context of enabling Agile development. We will discuss what a transition from a Monolithic to a Microservices Architecture looks like and share perspectives and best practices on Project Methodologies, Automation, Tooling and deploying code. Attend this webinar to make sense of our multi-cloud reality and how to most effectively leverage it to accelerate your journey to agile. With real-life customer best-practice examples from The British Medical Journal; Civica; Quotall; Acrolinx and Kaldor. The UK’s largest business marketplace, Applegate, recently migrated to AWS. CEO, Stuart Brocklehurst, talks through the ins and outs of why and how they got to where they are now and what the future looks like. Join us for this webinar now! Not managed to go to Las Vegas this year to attend AWS re:Invent? Worry not, we are consolidating a week’s worth of presentations and announcements into just 30 mins of your time… Come join us to see how we have coped with this challenge! AWS has grown at a phenomenal rate since 2006 and released a total of 722 new features and services, just in the last year – how does one keep up you may wonder? Well, AWS re:Invent – the world’s largest AWS gathering – is a great starting point but of course, it’s about much more than feature releases – how do you figure out what is relevant to your business? How do you assess whether your business is ready to effectively use AWS? How do you take what is available and deploy it to your own benefit? This is your chance to get a very personal download on what's happened at re:Invent - don't miss out! Cloud has moved beyond the realms of market hype to become a reality, but for many the journey has only just begun. What risks do you face when moving your IT workloads to a cloud environment? What regulations do you need to take into account? How do you establish what you need in a market proliferated by different providers and platforms? This webinar will answer some of the practical questions companies face when exploring the next step on their Journey to Cloud. This is a webinar for executives in Financial Services looking for tangible, strategic guidance and best practices in cloud. The webinar is facilitated by Kevin Linsell, Adapt’s Director of Strategy & Architecture. Does today's business imperative create security schizophrenia? All businesses are set to create and deliver value, but increasingly the emphasis is to do so both securely and fast. 'Security' and 'agility', in theory contradicting objectives, can they coexist? And if so, how? This webinar reviews the journey to DevOps and 'Hyper Hybrid' IT hosting through an InfoSec perspective. In this webinar we view security through two diverse mindsets, as ‘played out’ by our Head of Security & Compliance, Simon Schofield, and our Director of Strategy & Architecture, Kevin Linsell. This is a webinar for business and IT executives looking to understand the realities of managing security in todays’ ever more agile (IT) environment. Not attended VMworld? Join our webinar as we discuss the hottest ins & outs that came out of this years' event with VMware's Stuart Simmons. VMworld continues to evolve to meet the needs of the marketplace – Transforming from its primary virtualization focus, the conference now includes content regarding Unified Hybrid Cloud, Cloud Management and Services, Hyper-Converged Infrastructure, Business Mobility and Network Virtualization making it one of the world’s premiere business events. In this webinar we discuss the hottest ins and outs that came out of this years' event. Our Director of Strategy & Architecture, Kevin Linsell will discuss an update with VMware's Stuart Simmons. This is your chance to get a very personal download on what's happened at VMworld - don't miss out! Regulation. Risk. Choice. There is plenty to consider on your Journey to Cloud. Join us to revisit what you know and gather fresh insights and best practices to defining and executing your Journey. Greencore is the world’s largest sandwich manufacturer and a leading convenience food producer in the UK and the US. If you’ve ever bought a supermarket BLT or sushi box, it’s likely you’ve enjoyed a Greencore product. 1st Credit migrated key applications over to a multi-cloud platform to reduce overnight processing by an average of 1.5 hours and to improve performance by up to 20%. View this video to find out how! As one of the UK’s leading debt purchase and collection companies, 1st Credit has supported over 350,000 customers in reaching a debt-free future. The company is widely known for its ethical approach to debt collection and for treating customers fairly. MADE moved to a multi-cloud environment that scales to their evolving needs, seamlessly supporting sudden and extreme demand from its online customers. View this video to find out why & how! MADE.COM has revolutionised the furniture industry, creating a new way to shop that puts the customer at the heart of the manufacturing process.Working in partnership, MADE and Adapt have increased underlying server performance by 40 per cent, also winning the prestigious Retail Project of the Year title together at the Techworld 2014 awards. Moneycorp transformed its approach to IT, migrating to a Managed Cloud outsource and reducing Recovery Time from days to just 15 minutes. View this video to find out how & why! Moneycorp is the UK’s leading independent foreign currency exchange broker, completing more than 2.4m customer transactions and trading £11bn in foreign currency per year. Kivue reduced the number of service outages from daily interruption to zero, improving the quality & availability of service delivery and giving them the freedom to scale and change as the business evolves. View this video to find out how! Kivue is a software solutions business, specialising in software that supports effective communications and performance of portfolios of change programmes. Kivue provides businesses with a key view into their software assets. Greencore chose to fully outsource the management and responsibility for its infrastructure. View this video to find out how & why! Greencore produces a variety of convenience food in large quantities every year for retailers and food service outlets in the UK and the US, generating £1.3bn annual revenue via its 22 state-of-the art manufacturing facilities. A staggering 650 million sandwiches, 200 million prepared meals and 3 million Christmas cakes are produced by Greencore every year, underpinned by the business’s passion for quality and customer insight. In this webinar we discuss the changing role of cloud computing to the Digital Agency with Antony Cox, Head of Technology at Acknowledgment, Tom Jordan, Founder and Managing Director of Acknowledgement and John Galpin, Managing Director at Structure. Your business requirements are evolving and technology has to keep up. What considerations should be taken into account when looking at making an investment in cloud? How do you know what type of cloud best suits your new requirements? View our webinar discussion with Cisco and VMware to find out. The Evolving Role of IT, The Digital Agenda & The New Cloud Economy. Monthly insights, opinion, best practice and a healthy dose of provocation on the trends, challenges and opportunities residing in our New Cloud Economy. Our content moves along the cloud journey and well beyond - stay tuned!